The Diffendals were one of the first families I researched in Green Hill. Unlike other names in the graveyard such as Conrad, Penn, Dibrell, or Sutherlin, this was an unfamiliar surname. 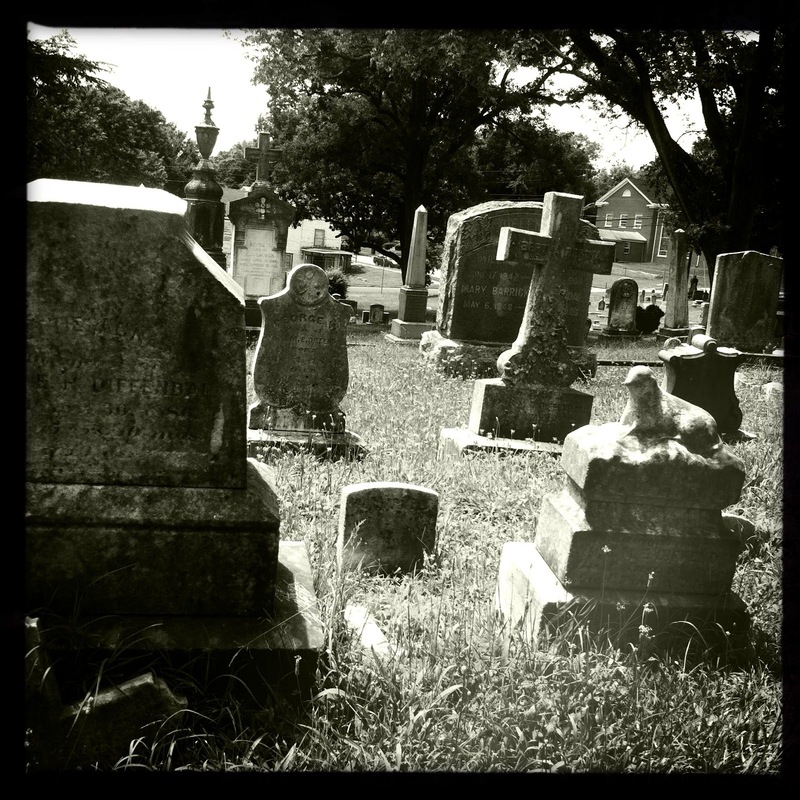 I’m unaware of any street, building, monument, or park named for the Diffendals in town; but I felt compelled to visit their square repeatedly and look into their history, pulled towards their tombstones by some unseen force of attraction. There are no tall obelisks or mammoth angelic surrogate mourners in the plot, but there are several children’s markers detailed with inscriptions and motifs rich in late 19th century symbolism and which give one the sense of sorrow that the living felt as a result of each death. At the far end of the plot is a marker bearing the names of William Diffendal (1842-1904) and his second wife Mary Barrick Diffendal (1848-1926). To the right of their marker is the grave of William’s first wife, Emma Shaw Diffendal (1851- after 1873). William and Emma, originally from Maryland, were married in 1868. The couple had several children before her death. I noticed that in some literature Emma is referred to as Ellen, but according to her tombstone (which I spent some time tracing with my fingers), her name was Emma. William and Mary (also from Maryland) had a number of other children after their marriage. If the information on the 1900 census is correct then William and Mary wed in 1879, but it’s not uncommon to find errors on handwritten records from census enumerators. 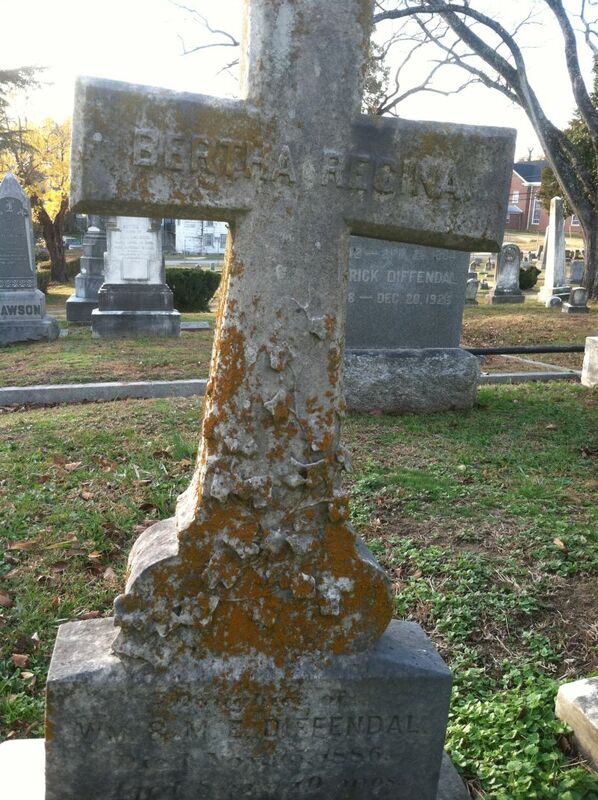 Emma’s tombstone is badly weathered and her year of death is illegible. I’ve been unable to find concrete evidence of her death year. Determining which children belonged to which mother is complicated by this issue. Mortuary reports for some of the children list Mary as the mother, but those records don’t specify whether she was the birth mother or biological mother. 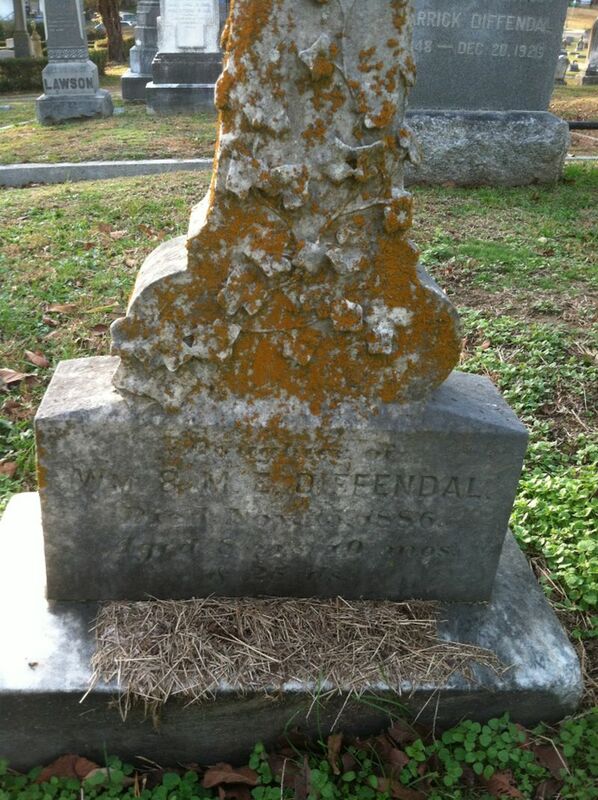 Bertha Regina Diffendal was born “about 1877” in North Danville according to Virginia’s Death and Burial Records Index. Her tombstone lists Mary as her mother, but this would conflict with the 1879 marriage year (unless she was born out of wedlock, which *could* always be a possibility). William held different jobs over the years, including employment as a railroad agent and contractor. In 1881 the Diffendals lived at the corner of Henry and Keene Streets in North Danville. This is likely where they lived in November 1886 when Bertha died, as her place of death was a Henry Street residence. That year there were a number of children in the household: Bertha, Mary Alice, Joseph, Mary Edith, and Henrietta (“Hettie”). Charles Edward was born in December 1886, just a few weeks after Bertha died on November 15. (Another one of the children passed away November 30, but I will save her story for another post.) Bertha was 8 years and 10 months old when she lost her life to membranous croup, a term interchangeable with diphtheria during the 19th century. November and December of 1886 were bittersweet months for this family, between losing two daughters and the birth of another son during the holidays. Actually I think “bittersweet” might be a bit of an understatement.